"Air on the Dirac Strings" explores the rotation of objects connected by a belt or by strings to a fixed background. Such an object plus its connections to the background will be entangled by a 360 degree rotation, yet returned fully to its original configuration after a 720 degree rotation. This combination of topology and geometry has applications to the physics of an electron. The geometry/topology of the Dirac string trick is intimately connected with the quaternions. The patterns of rotation of an object that is connected to a background are described directly by the quaternion algebra. 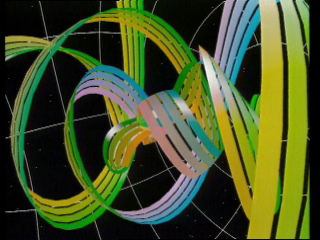 The quaternions are also useful for representing rotations in the usual sense, and they were used in this way to program the graphics in this movie. This motion has been incorporated into the Philippine wine dance where a dancer rotates a wine glass 720 degrees without spilling a drop.